The purpose of this chapter is to provide an overview of the operations research techniques employed across the Department of Defense, focusing on how the operations research officers and government civilians contribute to senior leader decisions. There are four general areas that the Department of Defense conducts operations research: assessing strategic goals through a gap determination process; assessing the effectiveness of operations and exercises, wargaming, modeling, and simulation of combat for strategic analysis and acquisition; and personnel analysis across the Joint Force. The authors will describe the management processes and components of military only so far as needed to provide the context and background required to adequately describe the operations research techniques. 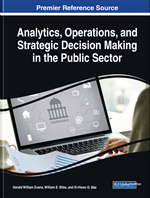 This chapter will contribute to the overall mission of this book by generalizing the techniques used by the military to demonstrate how analysts can better evaluate proposed and existing programs throughout the government and the public sector. Operations research as a discipline was an outgrowth of scientific and technology development early in the last century. Following World War One, researchers contemplated how to best implement or defeat aeroplanes, submarines and a large armed battleships (McCloskey, 1987b). In 1937, B.H. Liddell-Hart, a premier British military theorist, noted that “The way that decisions are reached…is lamentably unscientific.” He proceeded to submit that the investigation of [military] problems ought be assigned to “a body of officers who can devote their whole time….composed of the best of intellects…with a good blend of practical experience…given to originality of thought…supplemented by…some first rate university men…trained in scientific enquiry” (Liddell-Hart, 1939). The real growth in the nascent “operational research”, however, was not designed to improve decision making. Rather, it came as researchers sought to integrate the use of the newly-invented radar into operations to turn the Battle of Britain. By the end of 1941, operational research existed in all major military commands in Britain and expanded to various organization in the United States Navy and Army Air Corps. Operations research enabled the Air Corps to drop some 13,000 mines using radar to sink or damage 1,075 ships in March 1945. Operations research reduced losses of surface ships (Morse, 1951) and improved the sinking or grounding of blockade runner submarines (McCloskey, 1987a). In the years since WWII, leaders have recognized the value of analysis exceeds beyond “operational”. Resultantly, the discipline has expanded to include a broad array of decisions. Five broad categories of analysis now exist in the Department of Defense: manpower and personnel, combat modeling and analysis, test and evaluation, program analysis and evaluation, and training and operations. To keep in the context of public sector analysis, the authors narrowed the focus to strategic decisions and defined strategic analysis. For the purposes of the DoD, strategic refers to decisions regarding enactment of national policy, planning and execution of military campaigns, and resourcing of military forces. The DoD Directive on strategic analysis specifically states that products shall support deliberations on strategy, planning, programming, and budgeting including matters of force sizing and capability development (Department of Defense, 2011)2. Within the Department of Defense, there are numerous organizations. The major organizations are the Office of the Secretary of Defense (OSD), the Joint Chiefs of Staff (JCS), the United States Army, United States Navy, United States Marine Corps and United States Air Force3. OSD, JCS, and the Services all have multiple analytical entities which engage in operations research analysis to help senior leaders make better informed decisions, especially regarding major expenditures for strategy and policy, operations, acquisition of materiel and human capital. While each Service is has developed their own analytic means, the authors use their experience in the Army and Joint Combatant Commands for the examples below.